Thrifting is my favorite frenemy. Then spring came, and I found myself with a closet full of stuff I didn't really love. Complicating matters is my legendary affliction of feeling sorry for ignored, unloved apparel. Not only did I have to face their forlorn faces, I peer pressured myself into wearing them. Regularly. So I purged. I repented. I regrouped. I bought an $80 gingham shirt off the rack at JCrew. Regrettably, I'm too complicated a person to say the story ends there. Because when winter came back around, I heard the siren call once again to get out amongst the people from time to time without spending money that didn't need to be spent. I needed a new thrift-store diversion. I needed a new hunt. 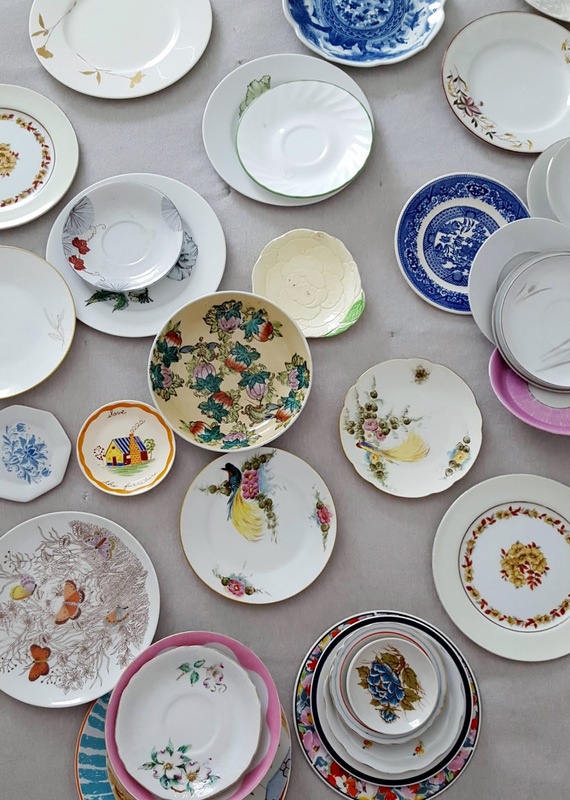 I don't remember how I zeroed in on the next object of my obsession, I only know that when my sister and I went thrifting a few months ago, she heaved a deep sigh and said, "I guess I'll meet you in an hour right here in the plate aisle." She knew I would still be there an hour later and she was 100% correct. I began scooping up plates for...something. Since I live a nearly-wall-less existence, it became clear to me that these plates were never meant for me. Lo, I would need to set them free. For almost a full orbit of God's green earth, I scoured every thrift store I encountered for plates. I stepped around boxes of plates in the narrow walkway around the perimeter of our bed. I moved stacks of plates around the house like darling chess pieces. Not a day went by that I didn't think about the plates (and, by virtue, you) probably because it became freaking impossible to ignore the stacks of plates closing in on me especially in February when northerners basically begin to hate everything oh my gosh. The funny thing is, I never did this to earn cash. I figured the hours of idle pleasure the plates afforded me meant they had already paid for themselves and la-di-da about shipping costs and a big "Whatever, man" about the prices of bubble wrap. Guess what? I wasn't a business major in college. Long story short (let's pretend this is a short story), I had an epiphany. My local friend Jolene and her family are embarking on bringing another babe home via adoption and I want to sell these plates and give the proceeds to them as a token of love and support. When we were in the process of adopting Calvin a friend sent us a check for $50 and a cried my eyelids raw. I get it, I love it, and I want to be a part of it. I've also watched Jolene generously support other adoptions over the three years I've known her and I want her to feel that love bouncing off of all of us and smacking her right back on the forehead. In love. I have a feeling you'll want to be part of it, too. And not just for the plates, though they are pretty rad and curated and perfectly Anthro-quirky and wall-ready, if I do say so myself. Here's all you need to know: I created a bunch of plate wall collections and one of them has your name on it because if there are only three things I truly believe in the world right now they are: 1) God is for us 2) Silas never, ever stinks, not ever and it's weirdly amazing. 3) Every home needs a plate wall. Here's a post my friend Layla wrote about why we were hardwired to care deeply about plate walls, or at least that's my interpretation. Keep in mind, the sets could be their own little plate wall, or they could be a starting point for a big, crazy-awesome plate wall. Plates for all! Plates for your wall! Plates are the new wallpaper. That's what I always say. The fun starts tomorrow at 10:00 AM EST. The selection is varied, some are eclectic, some are colorful, some are neutral. I carefully curated each collection according to what I would want hanging on my own wall. I actually wish I could keep them all for myself. Announcement: Tomorrow's auction has been canceled! If you need one of these one-of-a-kind collections up in your business, you'll leave a comment on tomorrow's post with your paypal email address and your bid. Here's the kicker: you'll need to keep an eye on the comments, lest you be outbid. 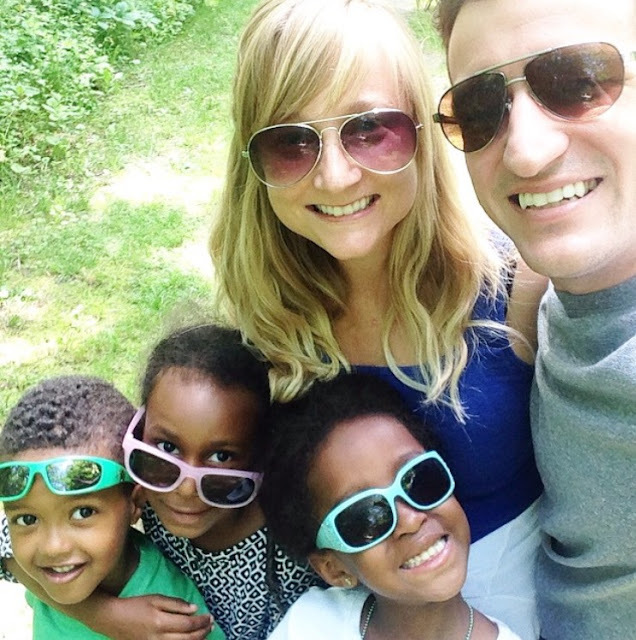 Remember, this is an adoption fund-raiser, so you're not just buying amazing plates, you're helping build a family! I'll leave you with this one enticement, not because I secretly think it's the best collection, but simply because it's named Collection 1. I'm glad I'm not the only one who overdoes thrifting from time to time. I laughed out loud reading about your clothes experiment. I've been making capsule wardrobes with thrifted clothes for a few years. Some times they work well. Other times I buy real pants that sit in my closet until I re-donate them. I've been wanting to put a plate wall in our dining room so I'll be sure to check out the auction tomorrow. What a fantastic cause! What a wonderful idea! I haunt the thrift store plate aisle, too, but my goal is church plates. I like the drawings of church buildings on the front, and I LOVE the paragraph that's usually on the back, giving the congregation's history. Is there a way to donate without winning an auction item? A friend of mine uses church plates as their regular plates and I think it's genius! I'm thinking hard about doing a second-hand-only clothing challenge for myself. Shirts, cardigans, sweaters, jackets...bring it on. So easy. But jeans?? Aww, I'm torn straight down the middle. And if we weren't downsizing to a house 1/5 the size of our current one, I'd jump on the plate auction...you speak my love language which is thrifty treasures. I was appalled it was left out of the book because obvs it's a real thing. might I suggest (ohmygosh!!!! my Dad ALWAYS says that and us kids (kids, I'm 35 - adorbs) always inside-joke about it) anyway...get your "thrifted" jeans from e-bay. I love me some high quality/high dollar jeans, and since all of my things are bought at gdubs, but I've only two beautiful times found "real" jeans there, I force myself into a mall store, figure out which $200 pairs (apparently that's a real thing???) fit best and then I go trolling ebay until I get them for around $30. which, of course leaves me $170 to spend at rich people suburb Goodwills. yes and amen. you're welcome! I find this comforting and inspiring as I have an affinity for bowls 😂 But only thrift store bowls, every time, beeline for the bowls. Great idea! Can.Not.Wait. 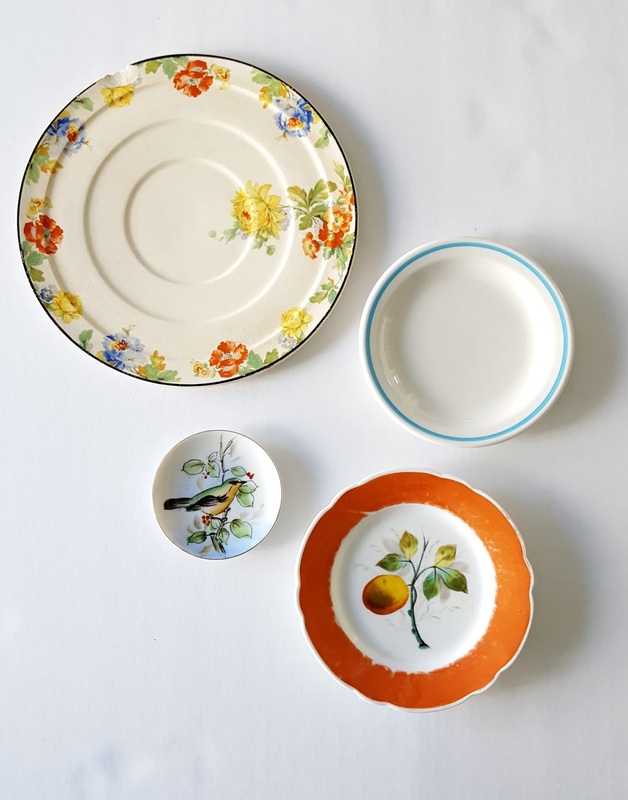 When my older son was getting married, I haunted thrift stores in search of white plates for the rehearsal dinner. Such fun. (And then I ended up not using them.) Most of the thrifts near me seem to have "tidied up" since then, and, sadly, the plate sections seem to have shrunk. :-( See ya tomorrow! I love you, I love you, I love you. Is that a bit much? I don't care because this is genius and awesome and just so YOU. Also, thrifting such a frenemy. I just can't quit the hunt. Can't wait to see your collections; I know they'll be rad. I laughed out loud twice. How many times would you guess you've said "plates are the new wallpaper"? And Ha! eBay. It's so true. We win the right to pay for something. They are geniuses. Well played interwebs. You've led the charge in ridiculous social acceptances. "Plates are the new wallpaper. That's what I always say." Well, now I always say it too! And your Announcement mid-Nitty Gritty had me literally LOLing. How fun is this? I've been crushing on your plate wall since I fell into your lap and now, there's only one thing to do...see you tomorrow! also, I NEED (this is not a want) a collection of about 5 of the plates you used in the top picture. NEED!!! I'm so glad I'm not the only one who loves thrift store plates...sometimes I just pet them... But, unlike you, I always talk myself out of buying them. Now I am wiser, thanks to your bold love for thrift store plates. I have been freed! I will tell my husband, "but you should see how many Shannan has!!!" I am laughing, so hard <3 I love your writing and your perspective on life and THIS IDEA! I have never once in my life thought about plate walls and now that I have read this post I know BEYOND A SHADOW OF A DOUBT that I need a plate wall. I once was blind but now I see. Amen and thank you. A plate wall AND help build a family? I am so very much in! What a fantastic idea!! Swoon!! I am so relieved that there is someone else out there collecting un-needed plates at Goodwill, for some unnamed purpose. It's so gratifying to find something pretty that costs so little!! I would like to bid $100 on collection 35. My email address is cferrier@beaconhealthsystem.org. You are a plate wall genius!!! LOVE this little pairing!!! Hi Shannon. I'd like to make a donation to this family. Please tell me how. 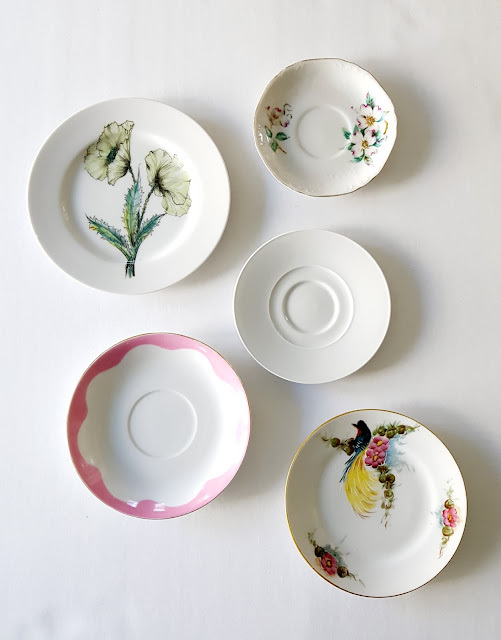 I don't need the plates, although they are pretty! My daughter & her husband adopted a newborn last July. He's blessed us all beyond measure. I want to help. Thrifting saves a lot of money as well as time for the most of the people who want to get their desired clothes or other things. There are some risks with the second hand shoping, but during thrifting you should be aware of it's quality. This bestessay.education review will let the people know about it's quality and it's advantages for the future.Many people think thrifting in many ways.I also like to do second hand in most of the cases.